Located among 80 acres of lush vineyards in the Chautauqua area of Western New York, Five & 20 Spirits & Brewing is a rare find. New York’s first combination winery, brewery and distillery, Five & 20 Spirits & Brewing represents the latest outpost of Mazza Vineyards, a 45-year old Pennsylvania winery famous for growing grapes and producing wine across state borders in the Lake Erie region. For the Mazza family, New York’s range of business incentives and support for wineries, farm brewers and distillers make the Empire State fertile ground for expanding – and reinventing – existing operations. The business began 13 years ago in the Mazza Chautauqua Cellars in Mayville, N.Y., where it operated a small batch distillery to make fruit brandy, grappa and other spirits for its fortified wines. 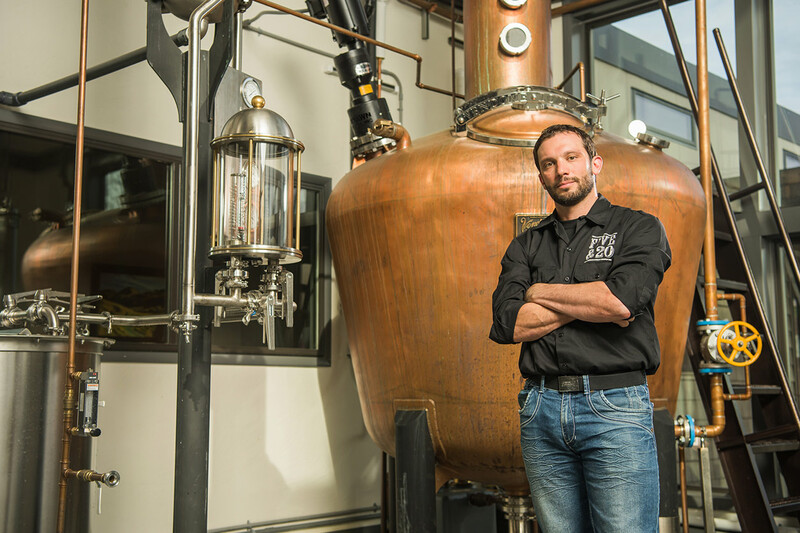 In 2013, as the craft beverage boom gained momentum, the Mazza family decided to co-locate its distillery – now called Five & 20 Spirits – with their Mazza Chautauqua Cellars wine operation at a newly constructed facility in Westfield. Set among Mazza’s existing vineyards, the distillery brought its “grain-to-glass” small-batch approach to beer, making it the state’s first “trifecta” distillery, brewery and winery. Chautauqua County occupies a significant portion of the multistate, 50-mile Lake Erie Wine Trail. The county alone produces approximately 65 percent of New York’s annual grape harvest, and now, thanks to passage of the state’s farm brewing bill, hops are being reintroduced to the region. Five & 20 General Manager Mario Mazza buys the majority of the hops for the new facility’s brewery from local farmers: their “purposefully unfiltered” offerings aim to preserve the local flavor of these ingredients. But that’s not all that makes this producer unique. 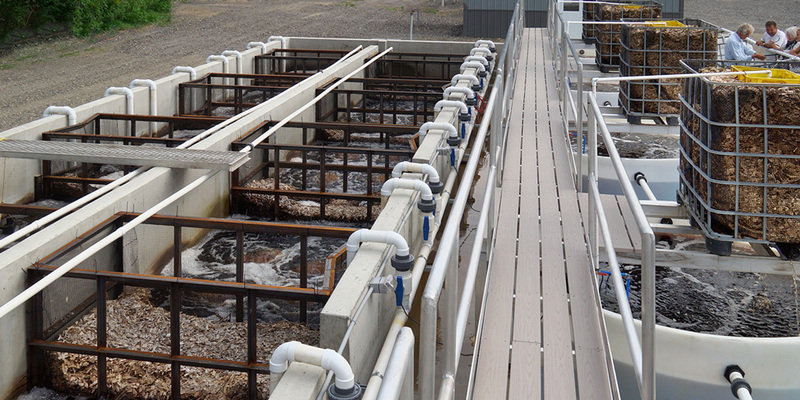 Last fall, Five & 20 collaborated with TimberFish Technologies to create a sustainable fish farm within the facility’s treatment-production system. Part of an effort to slow the impact of rising energy, feed and waste costs in traditional fish farming, the renewable concept transforms some 1,000 gallons of unused brewery wastewater and discarded grain into alternative fish food. It will also save Five & 20 a lot of money: the cost to remove unused brewery wastewater can run upwards of six figures per year. That kind of overhead, says head distiller Joe Nelson, led Five & 20 searching in earnest for a solution. The facility’s nitrogen-rich nutrient stream containing excess water, leftover yeast and bits of grain is now composted with locally produced wood chips to yield clean water. This water contains microorganisms that sustain snails, worms and other invertebrates that the farm-raised bass, catfish and perch can eat. The process also saves Five & 20 valuable production time and nets a greener result overall, adds Nelson. TimberFish Technologies, now a Western N.Y. Regional Economic Development Priority Project, estimates the system could eventually produce 3 million pounds of fish per year and add some 300-400 new jobs to the local economy. The state invested $100,000 in grant funding to help TimberFish build the high-tech operation with Five & 20. And, nearby SUNY Fredonia recently created an on-site learning lab for its students to study this innovative aquaculture system. Once the fish reach maturity in 2019, they are destined for Five & 20’s seasonal restaurant Bird, as well as other local outlets. The TimberFish and Five & 20 collaboration is helping to demonstrate the tangible benefits to other breweries interested in setting up similar partnerships. In a region already ripe with business and educational partnerships, Five & 20 and TimberFish are proving that Western New York is a fertile entrepreneurial environment where creative business plans, making the best of local resources, can flourish. To learn more about the craft beverage industry in New York State, visit https://esd.ny.gov/industries/craft-beverage. Western NY has captured the world's attention, thanks to its affordable real estate, world class academic and research institutions, growing downtowns and quality of life. Learn more about what NYS is doing to support and grow the craft beverage industry.